Holographic emerald dragon scales, engraved. Each model is hand-made. It is doubled in natural leather, certified and numbered which makes it a one-and-only product. Each model is delivered in a gift box including a wooden presentation stand. 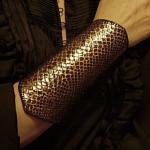 The products offered in our store have one size for all :Wrist : 15 cm to 17 cm - about 5,9 in. – about 6,7 in. For other sizes, all products can be custom made depending on availability. We can also satisfy any special request for a personalized model. Please contact us directly by e.mail. One size, tower wrist: 5,9 in. -> 6,7 in.